Jonathan LeVine Gallery currently presents The End is Far, a series of new works, a site-specific installation and live performance by Polish-born, New York-based artist Olek. Known for her bold work and vivacious persona, Olek’s ever-expanding interventions involve covering a multitude of people and objects in camouflage-patterned crochet including: bicycles, cars, shopping carts, construction vehicles and prominent public art sculptures such as Wall Street’s ‘Charging Bull'; ‘Alamo’ (Astor Place cube) and ‘Gato de Botero’ in Barcelona. The End is Far features new multi-layered crocheted sculptures and panels inspired by the events that transpired last year. With the addition of finely crocheted lace doilies, metallic gold ribbon and a new approach to typography, themes of freedom, justice, feminine power and strength are conveyed through subject matter such as boxing gloves, skulls, skeletons, sickles and horseshoes. An installation room containing a dining table set with china, overflowing fruit bowls, wine bottles and goblets will serve as an isolated environment for Olek’s crochet-covered female performers during the opening reception. This exhibition follows what proved to be a very eventful year for Olek. In 2011, she was placed on house arrest after a dispute with an aggressive male patron escalated at a London bar. Subsequently, despite creatively and financially stifling circumstances, Olek found herself motivated by the experience, determined to cover legal expenses and fight for her freedom. Granted permission to leave the UK between court appearances, 2012 became the most prolific year of the artist’s career to date, as she took on numerous international projects, public installations and commissions. 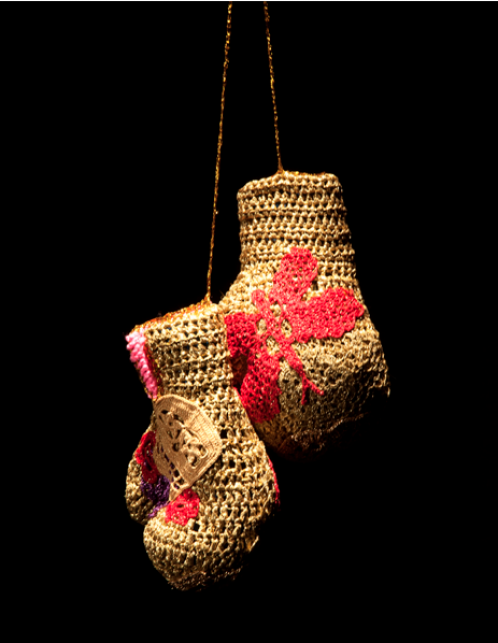 She was part of the 40 Under 40: Craft Futures exhibition at the Smithsonian, for which her entire crocheted studio apartment was exhibited. 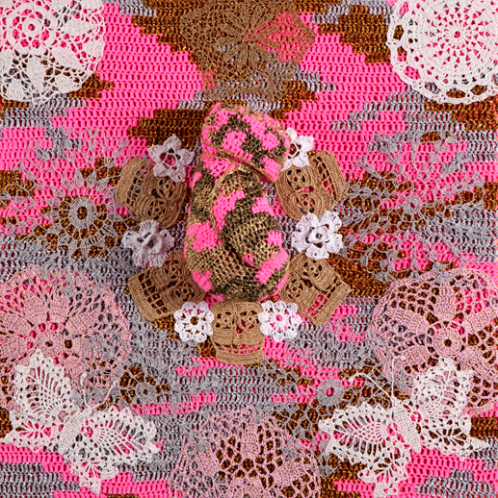 During the rest of her travels, Olek collaborated with women around the world, in Brazil, Hong Kong and Poland, learning new techniques and experimenting with different materials.